What happens between two nodes in an evolutionary tree? Hey guys can you help me with this one!? 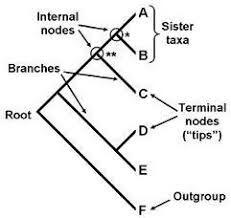 What happens between two nodes (in an evolutionary tree) or a between a node and a tip? The question does not make much sense and I think you've gone about as far as anyone can go. It depends what it means by character and it depends the detail semantic of the tree. In general, an evolutionary tree, usually called a phylogenetic tree attempts at representing time by the length of the edges in between two nodes. The goal is, in general, not to represent anything else. In the comments, @John has argued that time can be consider as a character. Personally, when I read the term "character" I think of a phenotypic character. While it will pretty much always be true that among two nodes some difference will exist in the phenotypic character, it is not a fundamental consequence of the concept of evolutionary tree. This is why I argued that A is false. @John takes the opposite stance in his answer. Note also, that sometimes (although quite rarely today) phenotypic states are used to build a tree and hence, in such case, it would be a direct consequence of the methodology that two nodes must necessarily differ by the value of at least one phenotypic character. This disagreement between @John and I highlights that the question is poorly phrased and actually makes little sense. Well, most likely enough time separate the two nodes that all organisms that were represented in the ancestral node are dead but of course they have reproduced, so that we actually have another node that descend from it. As you said, they evolve. So, things happen! As you said, those terms make no sense here! If there is any intuitive answer to the question what has happened between two nodes is time has passed. I think the answer your teacher was expecting here is E but it is also possible (s)he was expecting A. Really that's a pretty poorly written question. Your answer is A. for one simple reason, two different nodes represent at least one notable/measurable difference between groups, so between any two nodes there must be at least one difference. Look at this example, whether A and B represents Mammals and Birds or two subspecies of chimp, or two strains of virus the fact they are two separate nodes means there is some difference between them. When constructing a tree there has to be at least one character difference to have more than one node. A tree with no differences is just a dot by itself. Also an organisms does not stay the same between a node an the tip (the tip is a node) to use the below example the starred node between A and B is the most recent common ancestor of A and B which is not the same thing as A or B. Not the answer you're looking for? Browse other questions tagged evolution homework or ask your own question. What makes a good phylogenetic tree? Is it “easier” for researchers to detect evolutionary ancestry than distance in the evolutionary tree? Is there an evolutionary advantage associated with migraine? What is the difference between phylogenetic tree “construction” and “reconstruction”?